The Cambro 20PPCWSC190 half-size food pan seal cover is made of polypropylene plastic, and is made of translucent material for product visibility. 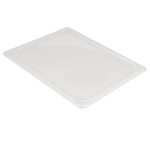 To reduce spills and prolong product freshness, the inner seal grips the pan. Preventing the lid from popping off large pans during transport and minimizing splashing, the seal has a tight fit. Its ends have thumb tabs to facilitate removal, and it is dishwasher safe. It withstands temperatures from -40 to 160 degrees Fahrenheit and will fit any half-size pan. Overall dimensions: 123⁄4 in. x 107⁄16 in. Need more information on food pans? Check out our Cambro food pans explainer to learn more.